Veröffentlicht am 26. März 2019 um 16:07 Uhr. Michael Hofmann has set a milestone in the recycling of postconsumer plastic waste. With his recycling company ecophoenixx, he created an innovative business model for plastic recycling to improve the recovery of polymers from postconsumer plastic waste. Around 40% of the 335 million tons of global plastic production per year turn into postconsumer plastic waste after one or two weeks of usage. And only 2% of this waste is recovered. With specific machinery, Michael Hofmann is able to convert rubbish into plastic granules, which can be used as raw materials to make new plastic products, such as wrappers or bin bags. The so-called hydro-dynamic washer, one can imagine it as a big washing machine, cleans and shreds the plastic, which is then converted into recyclate that Michael Hofmann sells. His technologies is in high demand, he already colaborates with other EU-countries, such as the Netherlands, Lithuania, Bulgaria and Finland. 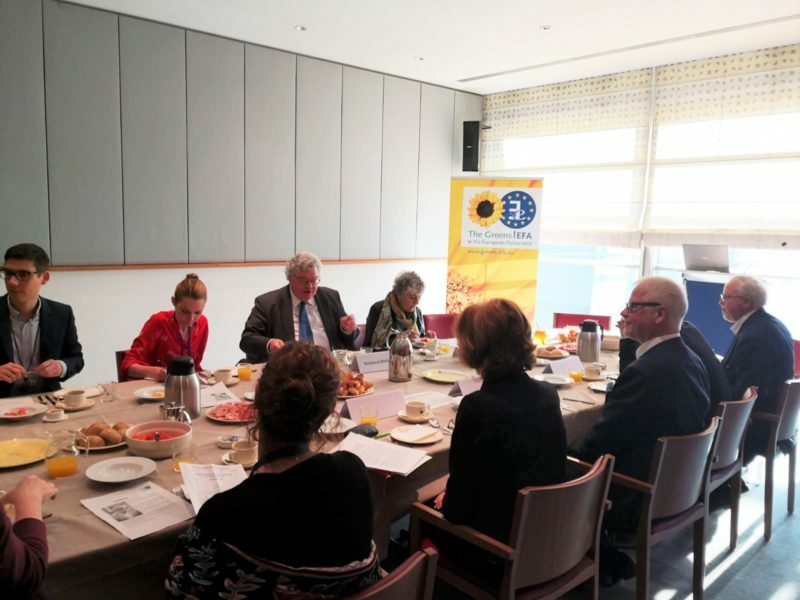 After visiting ecophoenixx in Schwerin, Germany in early January, I invited Michael Hofmann to a discussion in the European Parliament on 21 March 2019, in order to learn more about his decentralised plastic strategy. In addition, Bettina Lorz (Senior Expert and Team Leader, B3 – Waste Management & Secondary Materials, DG ENV) and Joan Marc Simon (Executive Director, Zero Waste Europe) joined the debate. After the presentation of Michael Hofman’s technology, we discussed the most pressing questions, such as how can plastic waste recycling become more economical, promote job creation and prevent pollution of the environment? How can the existing divide between the plastic manufacturing sector and the recycling sector be bridged effectively in order to promote more recycling? What are possible solutions to the main challenges faced by the recycling industry? We further discussed how the higher costs of recycling compared to the production of new plastic are limiting recycled polymers from becoming the first choice for plastic producers. However, with growing consumer awareness, demand for recycling has been growing since the past months. Furthermore, recent EU regulation, such as the packaging directive and the plastic strategy, constitute a better framework for recycling businesses. In a long-term perspective, collaboration between waste collectors, plastic recyclers and plastic producers will be key to a successful development towards a circular economy in the plastic sector. Am 21. März 2019 organisierte ich eine Frühstücksveranstaltung zum Thema Plastik Recycling. Dazu lud ich Michael Hofmann ein, dessen “Plastikmüllwaschanlage” (FHV Folienveredelung Hamburg/Ecophoenixx Projekt) ich bereits im Januar in Schwerin besuchte. Mit uns diskutierten Bettina Lorz (Senior Expertin und Teamleiterin, B3 – Waste Management & Secondary Materials, DG ENV) und Joan Marc Simon (Geschäftsführer, Zero Waste Europe) über mögliche Lösungsansätze für die Herausforderungen des Recyclings von Plastik. Dabei diskutierten wir drängende Fragen, wie zum Beispiel, wie kann das Recycling von Kunststoffabfällen wirtschaftlicher werden, die Schaffung von Arbeitsplätzen fördern und die Verschmutzung der Umwelt verhindern? Wie kann die bestehende Kluft zwischen dem kunststoffverarbeitenden Sektor und dem Recyclingsektor wirksam geschlossen werden, um mehr Recycling zu fördern? Welche Lösungsansätze gibt es für die wichtigsten Herausforderungen der Recyclingbranche? Michael Hofmann präsentierte seine innovative Technologie. Mit Hilfe einer “Plastikwaschmaschine” reinigt er Kunststoffabfälle ohne Chemieeinsatz und erzeugt so Polymere, die dann erneut für die Produktion von Plastik eingesetzt werden können. Wir diskutierten außerdem, wie die höheren Recyclingkosten im Vergleich zur Produktion von neuem Kunststoff verhindern, dass recycelte Polymere von Kunststoffhersteller bevorzugt werden. Mit steigendem Bewusstsein der Verbraucher, wächst die Nachfrage nach recycelten Produkten jedoch. Darüber hinaus bieten die jüngsten EU-Verordnungen, wie die Verpackungsrichtlinie und die EU-Kunststoffstrategie bessere Rahmenbedingungen für Recyclingunternehmen. Letztendlich ist der Schlüssel für eine effektive Kreislaufwirtschaft eine gute Zusammenarbeit zwischen Entsorgern, Kunststoffrecyclern und Kunststoffproduzenten.